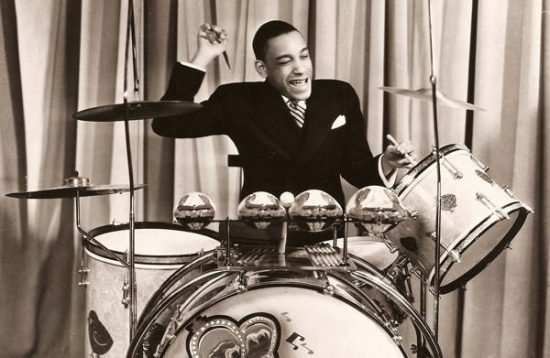 Chick Webb’s early death has tended to obscure the status he enjoyed among his peers during his lifetime. Best known for discovering Ella Fitzgerald, who recorded about 50 sides with Webb’s orchestra, including “A-Tisket, A-Tasket,” it was actually Webb’s drumming and the precision swing of his orchestra that made him a household name during the Swing Era. Art Blakey, Louis Bellson, Buddy Rich and other drummers who emerged in the early’40s spoke of him with reverence; Stan Levey, who played with Dizzy Gillespie and Charlie Parker in 1945, called him “my first hero.” Gary Giddins celebrated him as “an absolutely brilliant drummer,” and in the documentary series, Ken Burns Jazz, Giddins exclaims over the force with which Webb’s foot pedal work required nailing his drum kit to the stage of the Savoy Ballroom. Webb’s accomplishments were made all the more remarkable by the spinal tuberculosis that caused him to develop a hunchback, plagued him with pain and fatigue and led to his premature death in 1939 at the age of 34. (Webb’s birthdate was never firmly established, but most sources cite February 10, 1905.) Webb’s diminutive size only added to his larger than life stature among musicians and the thousands of jitterbuggers who packed the dance floor of the Savoy to hear him throughout the ’30s. While Webb’s recorded legacy is muddied by the aural quality of the recordings he made for Decca, and his band lacked for household-name soloists, he remains a compelling historical figure largely because of his association with the Savoy. Webb’s brilliant drumming was fired by a competitive zeal that served him well in the many battles of the bands he engaged in at the Savoy. Unfazed by any challenger, Webb’s orchestra locked horns with Basie, Goodman, Lunceford, Ellington and many others. As Louis Armstrong improvised in a lively duet with Ella Fitzgerald on “Stompin’ at the Savoy,” “Chick Webb cut ’em all.” In his autobiography Good Morning Blues, Basie credits an encounter with Webb for opening up new doors for his outfit. The two bands squared off on January 16, 1938, the same night that Benny Goodman presented his historic Carnegie Hall concert. Before the Count and several other Basie-ites went downtown to join BG, they did battle with Webb. It was the story of the Webb-Goodman contest that intrigued filmmaker Jeff Kaufman. “It was said that Webb’s band ‘wiped the floor’ with Goodman. Mind you, his was then the most famous band in the land. I said, ‘Wow,’ there seemed to be so little information out there. I just had to find out more.” The result is the documentary Chick Webb: The Savoy King, which premiered at the New York Film Festival in 2011.